How to choose the best Malik hockey stick in 2015? Goodbye shapes and hello colours! Despite many online retailers still stocking the fantastic Malik square range of hockey sticks, the most current Malik hockey sticks are the composite editions named as colours. So splash some colour in your game and review which is the best Malik hockey stick for you. How to choose a Malik hockey stick from the 2015 range? Now like everything Malik hockey, they don’t necessarily release sticks inline with seasons, or inline with anything for that matter, we love them for this quirkiness. To bring them inline with reality we will call this the Malik hockey stick range for the 2015/16 season. Dribble Curve – Malik dribble curve or DC shape is the shape the brand is famous for. As you would expect it is designed to be the optimum position and curve for great technical dribbling. In a number of our Malik hockey stick reviews we comment on how great this shape feels when dribbling the ball. The Malik Dribble Curve shape is a 24mm bow at 270mm up from the heel of the stick. Not low, not high, just right! Don’t be put off by the name, the Malik Dribble Curve shape is so adaptable to many parts of the game, in our opinion slap-hitting is also a players dream with this shaft. Multi Curve – Your other choice is of shaft shape in a Malik hockey stick is the newly named Multi Curve. This is Malik’s low bow designed for drag-flicking experts. The Malik Multi Curve shape is a 24mm bow at 210mm up from the heel of the stick. Again, slightly different from many other hockey stick brands. Only available in the Malik Heat hockey stick you should check our review to get more information. Like all other brands Malik hockey sticks come in a range of material compositions to suit. High carbon for stiffness, low carbon for feel. Notable is that every stick in the range has an level of Aramid for reinforcement in the head and reverse edge. Every stick in the 2015/16 Malik hockey range is based on the same design, a black carbon effect shaft with Malik in bold writing on the front and back. The logo on the front is white and is a colour representative of the name of the stick on the back. The colours are bold and standout really nicely from the black background. As always with Malik hockey sticks, they look really cool. Sorry if your required specification doesn’t come in the correct colour, perhaps you will have a new favourite colour when you buy your Malik hockey stick. Malik have also made it just a little trickier for us to get to grips with the range. There are UK & European version available and we are waiting to hear back from them about the rest of the world. In the UK there are Extra Light and Light versions with some of the range being available in 36.5” and 37.5”. All UK specification sticks are identifiable with white handles. In Europe there only seem to be light versions and not all of the range is available with the longer 37.5” versions of the stick. These are identifiable with black handles. Why they do this isn’t clear, I can only imagine it is supply & demand as despite being a well regarded, long established hockey stick brand I imagine Malik don’t like too many sticks wasting away on racks. 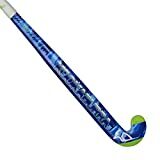 I love Malik hockey sticks, the dribble curve is beautifully balanced and this years top of the range Malik Azur was a great stick to review. If you like to be a little different, think Malik for your next hockey stick. Check out our best overview of the adidas hockey stick range too.